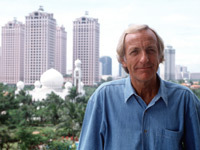 In order to examine the true effects of globalization, Pilger turns the spotlight on Indonesia, a country described by the World Bank as a model pupil until its globalized economy collapsed in 1998. The film examines the use of sweatshop factories by famous brand names, and asks some penetrating questions. Who are the real beneficiaries of the globalized economy? Who really rules the world now? Is it governments or a handful of huge companies? The Ford Motor Company alone is bigger than the economy of South Africa. Enormously rich men, like Bill Gates, have a wealth greater than all of Africa. Pilger goes behind the hype of the new global economy and reveals that the divisions between the rich and poor have never been greater -- two thirds of the world's children live in poverty -- and the gulf is widening like never before. The film travels to Indonesia and Washington, asking challenging questions seldom raised in the mainstream media and exposing the scandal of globalization, including revealing interviews with top officials of the World Bank and the IMF. "In another in a long line of passionate, wide-ranging and informative reports, John Pilger examines globalization: a process which, he believes, enslaves the many in order to empower the few. It is a deeply impressive, informative, heartfelt piece of journalism, and it proves that the small screen still can, when it has a mind to, bring us the big picture." "Pilger's analysis is sophisticated, interweaving Cold War politics and the workings of the World Bank and the IMF, and shows how corporations such as Ford now have bigger economies than South Africa, and the way many countries have been turned into giant sweatshops." "Globalization is a big subject to tackle and there's no doubt this latest film is a full meal, throwing a lot of factual information at the viewer. That it never feels overwhelming or unfocused testifies both to Pilger's film-making experience and to those political news instincts he developed at the Daily Mirror, in the days when the Mirror really mattered." "John Pilger is back with another quietly impassioned report on the insidious nature of globalization. His grilling of an IMF spokesman is beautifully understated, although it doesn't stop the man from spouting absolute rubbish. A must-see for those who think anti-capitalist demonstrations are led solely by thuggish anarchists." "Any new investigation by John Pilger is going to be an event, and rightly so as his brand of crusading journalism is so rare on the box today...In this compelling hour...he contends that the real power in today's global economy no longer resides with the governments but in the hands of a few huge multinationals...And watching him among the sweatshops of Indonesia, it's hard to disagree." "Even if you vehemently disagree with most of what John Pilger says, he puts forward a case that needs to be answered." "A calm, carefully articulated account of the monstrous crimes perpetrated by the heroes of globalization." "A scathing portrait of the way Western commerce has taken over the economy of Indonesia and continues to maintain its grip in a way which prevents the country from ever rising above its poverty."